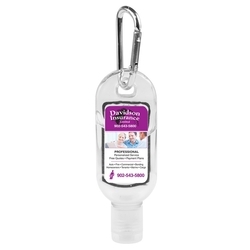 Clean up your brand image with the help of this handy item! 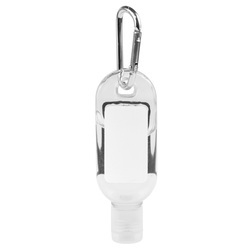 Use this carabiner to clip this bottle to your briefcase, backpack or purse and never leave home without it. 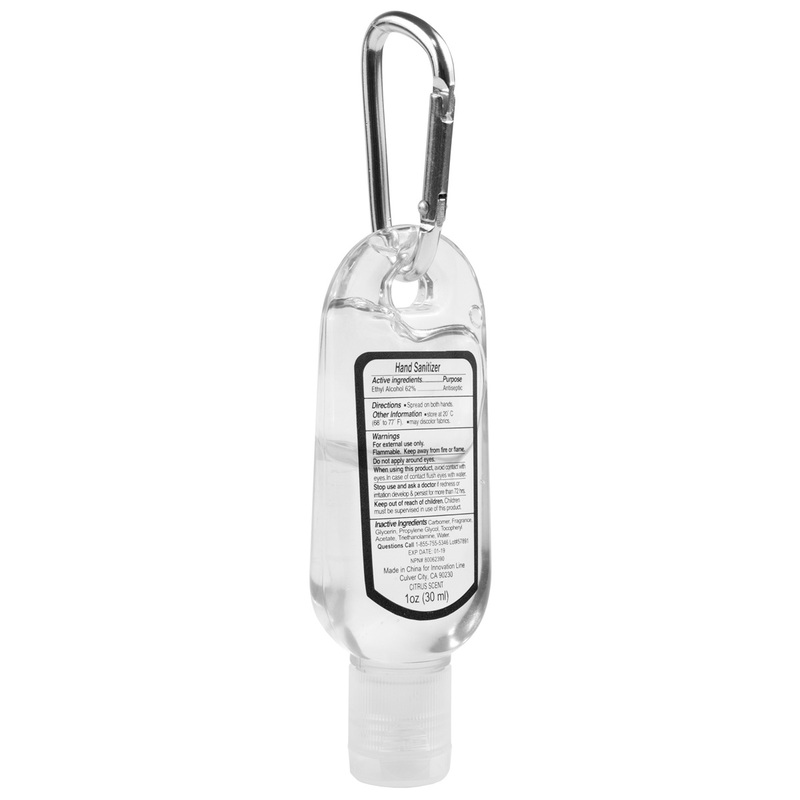 The bottle contains 1.0 oz of citrus scented anti-bacterial gel. 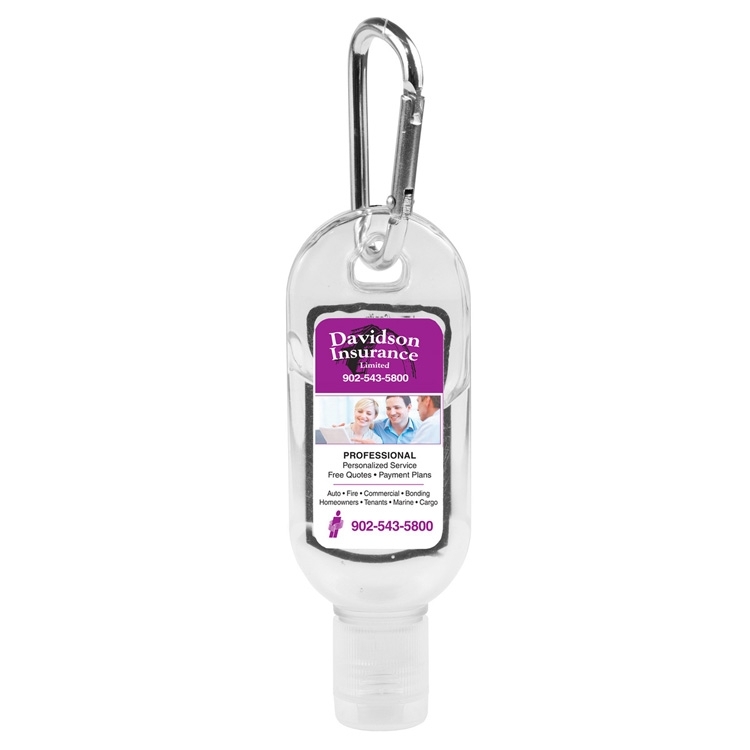 Available with spot color or 4 color process imprint; customize to create a giveaway perfect for distribution during upcoming conferences and conventions. What an excellent way to promote business! Meets FDA standards. Please Note: Small bubbles and variation in label application alignment cannot be avoided and is not considered a defect. 5296 - Photoimage® Full : Price includes: up to a Full Color Imprint on white vinyl label (exact color match not guaranteed). 5296S - Spot Color Direct Print: Price includes: one color imprint, one location. 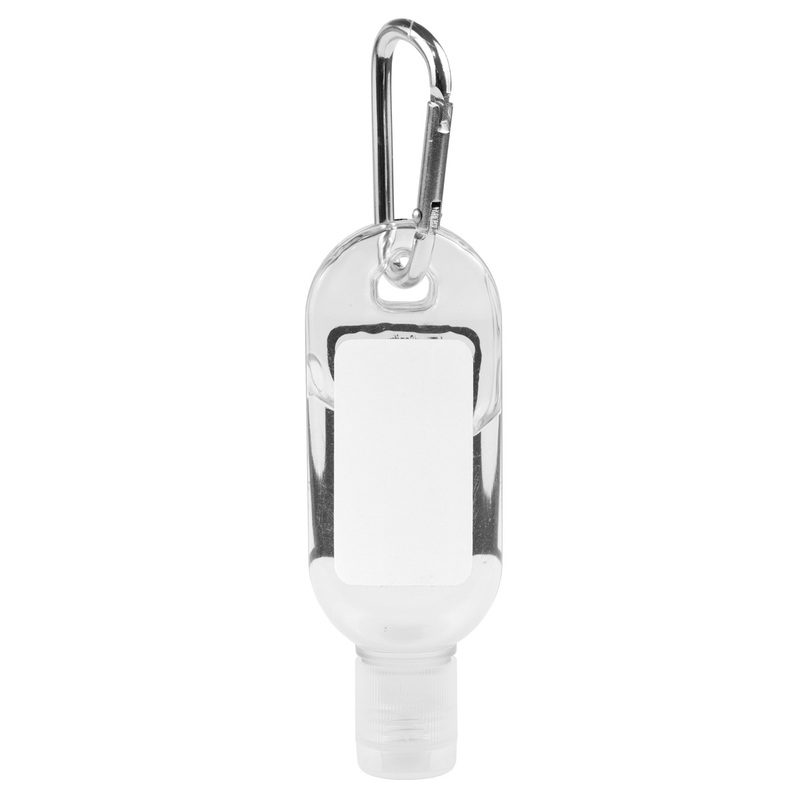 Pre-Production Proof: $45.00 (G), plus setup charges, cost of the item and cost of any additional color per unit running charges and freight charges. If any changes are made to the original artwork after receipt of the pre-production sample, then additional set-up charges will also be added to the invoice. Add 2-3 Days to production time. 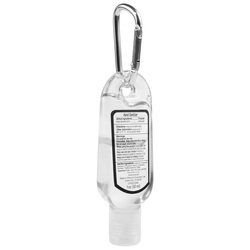 Please note: All sanitizer bottles include ingredient label on reverse side. Slight shifting of logo/text cannot be avoided. As each product is manufactured and logoed individually, up to 3/16” movement in logo alignment may occur. PMS inks are mixed by hand with some variation. Mixed colors will be close and cannot be exact or compared to e-proofs. Clear ingredients label on back will be visible through the front and may make imprint difficult to read. 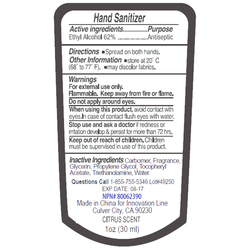 Small bubbles vinyl label cannot be avoided as labels are applied manually and cannot be perfectly aligned. Fine lines and small text are not recommended. In 4-color process / Photoimage full color printing, exact color match cannot be achieved. There may be a dramatic difference between the PMS Color noted, screen color shown and printed color. None of these can be considered a defect. Products are intended for individual use and cannot be compared one to another. In addition to shipping cost, hazardous materials (sanitizers and powerbanks) air shipping (including shipments to Alaska, Hawaii and Puerto Rico), will incur $55.00 documentation fee per box. 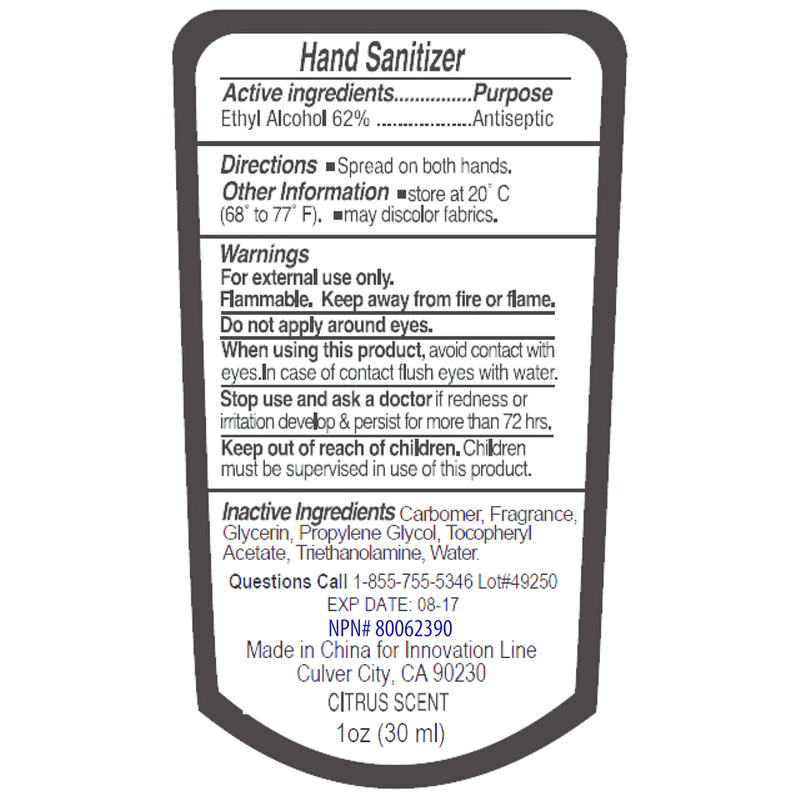 Fed Ex is the only authorized air carrier within continental US for Hazmat (sanitizers and/or powerbanks).